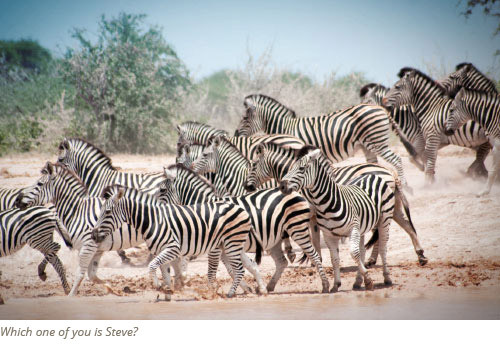 We have been plotting and planning safaris for over twenty years and we’re pretty good at it! Our safaris are traditional but comfortable. You won’t get wi-fi but you will get a large (3 x 3m) comfortable dome-tent, a stretcher bed with all linen provided, a towel, a wash basin, and a lamp. There will be a bucket shower with hot water and a toilet (with a proper seat – fancy!). We provide three meals a day. We start early mornings with a quick coffee, rusks and fruit. We then have a cooked breakfast when we get back from our morning game drive. Sometimes lunch is in camp, sometimes we take a picnic and set up somewhere beautiful. Dinner is two courses (main and pudding) and we provide wine. Tea, coffee, drinking water and juice are provided throughout the day. Please bring along any other soft or alcoholic drinks you would like for the trip. There are bottle stores in town or you can buy from Audi Camp bar before departure. Our safaris are non-participatory by which we mean you sit back and relax and our team set up tents, dig holes, build fires, heat water, cook and wash up. This is afterall your holiday. We have a number of really popular packages. These are private safaris that you can book for the dates you want. We can always add extras if you want to extend the safari. We know Botswana like the back of our sun-burnt hands. If you want to plan something special or just want a trip incorporating a number of locations, contact us directly. You can join a pre-booked safari with other guests: these safaris have set departure dates and itineraries and are really good value. The more people that join the cheaper the trip works out per person. 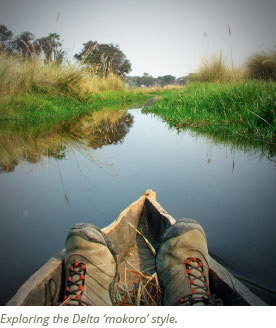 Background: The BaYei people came to the Okavango Delta hundreds of years ago, bringing with them, their traditional mode of transport – the mokoro, a dug-out canoe made from a large straight tree such as a sausage tree or an ebony tree. The mokoro is ideally suited as transport in the delta as in can move quietly through shallow water, being pushed by the boatman using a long pole, moving along the narrow channels or cutting through the long grasses or papyrus. Audi Camp has a special 20-year relationship with the Morutsa Village community and in particular a man named Mr Worm (Rra Seboko). Most of our mokoro polers come from this community and the money brought in by guests is vital to their economy. Mr Worm is always very keen to show people round the village. You climb on a 4 x 4 vehicle and bash around on dirt tracks for approx. one and half hours (the actual time depends on the season and conditions of the road) and you’ll be dropped at the mokoro station in the southern part of the delta. A mokoro poler will be introduced to you – he or she will be your boatman and guide throughout the trip. Depending on the length of the trip, you can expect to spend a few hours poling on the mokoro, having lunch along the way, and doing game walks into the bush. If you are overnighting, the poler will find a beautiful island campsite and help you collect some firewood for cooking. Remember, this is the bush and there are no facilities – it’s back to basics: no showers, no toilets. While you are on the trip, remember to listen to your guide – he has grown up and lived in this area most of his life. He will not only show you many fascinating things, he will also keep you out of trouble while you’re in the bush. The polers do not carry firearms on the walks and you may well encounter elephant, hippo, or even lion. At the end of your tour, an Audi Camp vehicle will pick you up at a prearranged time and bring you back to base camp in Maun. On this trip you provide your own camping equipment (pack light, it’s going in a mokoro! ), food and drink. You’ll need to remember everything including loo roll, matches, pots, drinking water and food for your mokoro poler. You can rent equipment from Audi Camp. (Rates include return road transfer, entrance fees into the concession area, mokoro and guide / poler). We provide everything for a basic camp (no shower or toilet) as well as food and drinking water etc but remember everything needs to fit into a mokoro! (Rates include return road transfer, entrance fees into the concession area, mokoro, guide/polers, all camping equipment, all meals and a cook to prepare the meals – excludes drinks, these can be purchased from Audi Camp before departure). 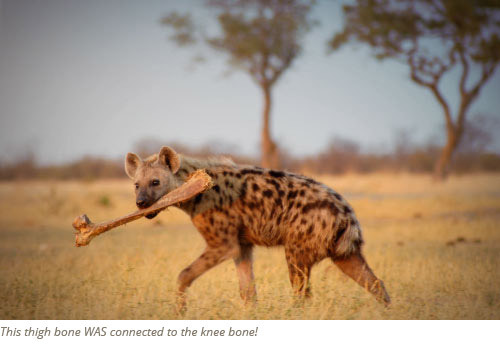 Moremi Game Reserve is situated in the Okavango Delta and the game here can be incredible: wild dogs, huge elephant herds, buffalo, large prides of lion, leopard....the list goes on and on and on. The bird life in the Moremi is also stunning thanks to the diverse, undisturbed habitat. 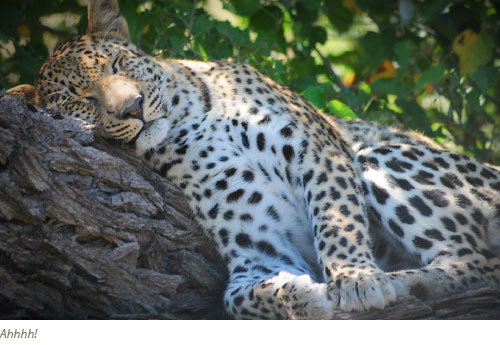 We run one, two and three day catered trips into the Moremi. The campsites are not fenced, so animals can and do wander around freely and you get the feeling of really being in the bush. We supply all the food and equipment for these trips. You need to bring along your personal belongings and any extras drinks you may require. We also offer motor boat or Mokoro trips (either a whole day or a few hours) into the delta – prices for the boats are available on request. A six day safari through the Chobe National Park and the Moremi Game Reserve. The trip from Maun to Kasane is a true bush bashing experience, with dusty, bumpy roads, game all around you and a feeling of being a million miles away from civilization. We use mostly HATAB campsites, which are situated strategically around the parks and are only used by licensed operators. 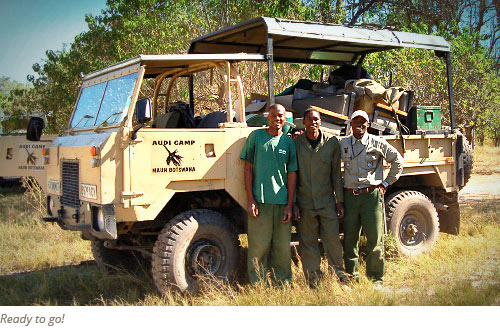 Depart from Audi Camp on day 1 and spend 2 nights exploring Moremi. On the third day move into Chobe National Park, spending 2 nights in the desert like landscape of Sauvti and onto the lush Chobe floodplains. Kick start day six with a drive along the water front and finish off with a three hour boat cruise on the Chobe River. We also offer a five day (four night) Moremi only safari which includes a boat trip in the delta. The Central Kalahari Game Reserveis situated in the middle of Botswana and is the largest game reserve in Southern Africa. The Kalahari gives you the true feeling of Africa with vast open spaces and beautiful clear nights – ideal for viewing the magnificent southern hemisphere constellations. There are designated campsites, but no facilities what so ever. All water has to be carried in so no showers – sorry, we can all gently humm together! Conditions can be extremely hot in the summer months with temperatures plummeting at night in the winter. The temperature shift can be as extreme as 30 degrees Celsius. Because of the distances involved we only offer this as a three-day safari. 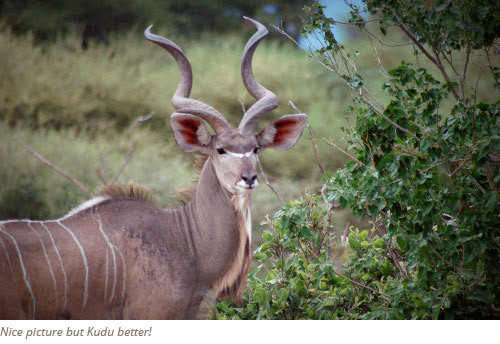 The Nxai Pans National Park is another wonderful location for a safari. During the summer months the game here can be sensational with zebra herds migrating into the area to take advantage of the flooded pans and the predators taking advantage of the situation! The bird life is also fantastic as is the landscape! At night the stars are mind blowing and it’s worth booking Paul Sheller, a Maun resident and an expert on African night skies to join you for an evening. With no light pollution and a large telescope, a night under the stars with Paul is magical (but don’t tell him we said that)! The Night Skies of Botswana - Star gazing with experienced amateur astronomer, Paul Sheller. An optional extra special activity that can be added to most of our safaris. People come to Botswana with the expectation of seeing the fantastic wildlife and wilderness areas that it offers. It’s only when sitting out in the openness of these pristine settings and looking up to those dark clear night skies, seeing that vast panoramic view of our universe, that one is suddenly struck by the awe and wonder of it all. After being in Botswana for over 40 years, I still have that sense of amazement every time I look up to our night skies. Since 1990’s, when I first got involved in tourism, I have tried to share that passion and my knowledge with our visitors to the country. I love getting people involved with the stars and astronomy, both from the scientific side of things (understanding about how stars live and die, how the universe was formed and how will it end) and from the cultural side (how did different cultures like the Bushman, Tswana and Westerners relate to the cosmos). I tend to combine the facts and figures with lots of storytelling, some personal experiences, some about the Bushman and Tswana people, and some about events – like what actually happened during the first lunar landing. I use a 10 inch computerized telescope in combination with my green laser light pen to show the all the incredible objects in our night skies, from the constellations to distant galaxies and often with the sounds and sights of the African night life around us (I normally bring my night vision binoculars along to watch some of the different animals that come out to visit). On a typical night of viewing, we might see Jupiter and the 4 Galilean moons or Saturn with its stunning rings, the beautiful double star Albireo, gaze deep into the Orion nebula or peer millions of light years into the past to see the Andromeda Galaxy as it was then. At the same time we may be visited by some of the curious nocturnal wildlife, possibly jackal, hyenas, porcupine or aardvarks. All of it makes for a fascinating and completely unique experience. The cost of this add on activity is BWP 2750. This is for one night. It doesn’t matter how many people are in the group. If it has to be cancelled we just give the money back. We don’t normally offer this activity on mokoro safaris as the equipment is heavy and doesn’t work well under water! This really is a special experience that we highly recommend. Rate your experience on tripadvisor.